As a 24 year old father of two sons, ages three and four, MARQUES LAURA never shied away from work or his responsibilities. He held various jobs and came to Worcester YouthBuild with his GED already in hand as well as visions and expectations of something more in his life. Marques always dreamed of being in the construction business since he was a small child. “I always wanted to do carpentry work,” he says, “I always wanted to work with my hands.” When he heard about Worcester YouthBuild through a program flyer, he thought it might be the opportunity he had been hoping for. 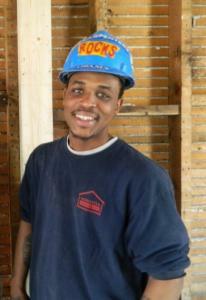 As a YouthBuild participant, Marques started to hone his carpentry skills at the Stone Soup Community Center construction worksite project located at 4 King Street in a distressed neighborhood in the Main South section of Worcester, MA. The Stone Soup Community Center is a 501c3 volunteer-run umbrella organization that brings together various Worcester leadership development and organizing groups under one roof. In March 2009, a fire destroyed much of the building. Worcester YouthBuild, in partnership with New England Carpenters Union - Local 107, Job Corps and other organizations has joined forces to help rebuild the center which will also contain a low-income housing unit when it is fully completed. The building is being renovated in accordance with its historical appearance. Incorporating many “green” features, the project is aiming for LEED certification. A self-described “hard worker” and “perfectionist”, Marques so impressed representatives from the New England Carpenters Union – Local 107, they invited him to join the Union as an apprentice and he is now getting paid to work on the project. “I would never have gotten anywhere in construction without YouthBuild. It taught me everything I needed to know and to do it right,” says Marques. In the next two to five years, Marques expects to own his own construction company and looks forward to building a structure from the ground up. While in the program, Marques and his fellow classmates also had the opportunity to participate in a Saint-Gobain Career Day in December 2011, visiting the SGC Abrasives and Ceramics Divisions in Worcester and SGC R& D Center in nearby Northborough. The students learned about the company, its products, and career opportunities, interacted with SGC employees, and were treated to a delicious lunch.